HubSpot for Startups: Good Deal or Costly Mistake? As you launch your business, there are a million things you’re told you should do and think about. Do research! Focus on your brand! No, don’t worry about your brand, just sell! What’s your mission? Who’s your target audience? Use this program! Don’t use that tool! In the midst of all the noise, how do you prioritize and know what tools you should actually use? That’s why we're here. One of the tools you might have seen is HubSpot, an inbound marketing and sales software that helps companies attract visitors, convert leads, and close customers. They’ve created special discounts for startups, complete with training and additional education. But what is HubSpot for Startups and is it a good investment as you look to build and grow your company? What is HubSpot for Startups? 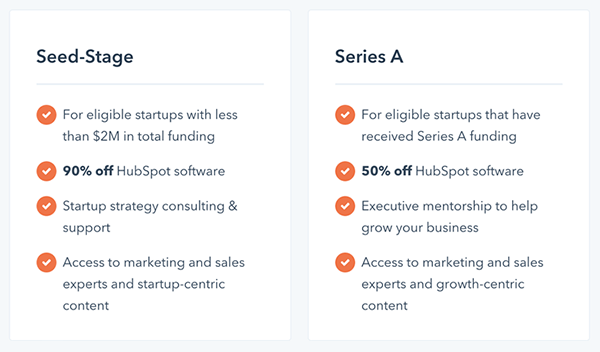 HubSpot aims to help startups grow by providing a year of discounted rates for their CRM, sales, marketing, and customer service software, with different packages based on the stage of your startup. They also provide onboarding and additional training in the inbound methodology so you can acquire and retain new customers. Sound like a good deal? It is. But a good deal doesn’t always mean a good investment (at least not right now – but we’ll get to that in a minute). What Are the HubSpot for Startups Discounts? This discount is for startups with less than $2 million in total funding. This discount is for startups that have received Series A funding. Keep in mind that the full discount only lasts for a year, with smaller discounts in the second year. After that, HubSpot charges the full price for their tools. So the real question is, is now the best time to invest in the tool? And will you have the revenue growth to handle the increased cost the next year? We’ve worked with a lot of startups who have the best intentions—but good intentions don’t always mean HubSpot is the best choice right now. Is HubSpot for Startups Right for You? Before we get caught up on the flashy discounts of 90% and 50%, let’s take some time to ask the difficult questions to see if your startup is ready to take the leap. Question 1: What is your strategy for HubSpot? Before you purchase a tool like HubSpot, make sure you have clear goals and objectives for what you hope to accomplish. Need to track and manage your customers? Want to send email newsletters? What about sales sequences? And ultimately—do you have the capacity to do any or all of this? HubSpot is an amazing tool but it takes extensive time and effort to use it well. It’s not a quick fix or a plug and play solution to your current marketing struggles. It’s an investment of both time and money. A powerful one. But not an easy one to leverage fully. Just like you aren't going to give a cheeseburger to a one-month-old, you might not give HubSpot to a startup. That cheeseburger might be the best thing in the world. But they're just not ready for it. It doesn’t hurt to be honest about where you’re at in the marketing process—regular email and the always-free basic HubSpot CRM might be the best option for your current objectives. There’s more power in self-awareness and knowing what tools you need right now rather than jumping ahead and adding expenses and stress to your life. But if you do have the time to create a decent marketing strategy and the bandwidth to execute on that strategy, HubSpot can be an invaluable tool to power and support your growth. Question 2: Is your whole team invested? If your entire team isn’t bought-in, you’ll miss out on the true value of HubSpot. Plus, it’s not only an investment in HubSpot as a tool, but in the whole methodology of inbound marketing, sales, and service. This means investing in content creation, lead generation, email nurturing, and more. It’s a lot of effort to do it well. The danger is that you might not see any return if you’re trying to use HubSpot for non-inbound marketing such as marketing to purchased lists or executing a large cold-call sales initiative. Once the whole team is invested, you want someone on your team to own HubSpot, from the implementation and onboarding to the day-to-day effort. You don’t need someone to focus on HubSpot full-time, but you do need someone to make HubSpot their baby. They’re the person who will learn the tool inside and out to help your team use it most effectively. Plus without investment and ownership from your team, it might be more harmful than beneficial. Have you ever poked around a website where they have a blog but haven’t posted anything in the last six months? Trying to do too much, too soon can hurt your online reputation, showing you have a lot of good ideas but lack the ability to accomplish them. Not the credibility you want as a startup. Question 3: What’s your website like? The primary idea behind inbound marketing is that you create awesome content on your website for each stage in the marketing funnel. That intrigues prospects and then your website helps to close the deal, getting them to sign up, sign in, or give you a call. But if your website is still a work in progress or not reliable, inbound marketing might not be the answer for you. Make sure your website experience is a powerful one so that when you drive traffic there, you can be confident that it will convert those visitors into leads. Your website doesn’t have to be large or complicated – it may only be one page – but it does need to offer a good experience. The foundation of a good website should be in place before you start building on top of it. Question 4: What future growth do you anticipate? While there are lots of things to figure out before you purchase HubSpot, that doesn’t mean it’s not a great tool and a good option. If your company is growing aggressively or if you have aggressive growth targets within HubSpot’s discount period, then HubSpot will likely be a great tool to help you achieve that growth. To recap, just because HubSpot is offering your startup a killer deal, it doesn’t mean their software is right for your company at this time. The last thing you want to do is get familiar with a tool for a year, store all your data in it, and then not be able to stomach the renewal fee. However, if you’ve got the desire, funding, and bandwidth to grow your company through inbound marketing, sales, and service, then HubSpot for Startups is the perfect deal for you. 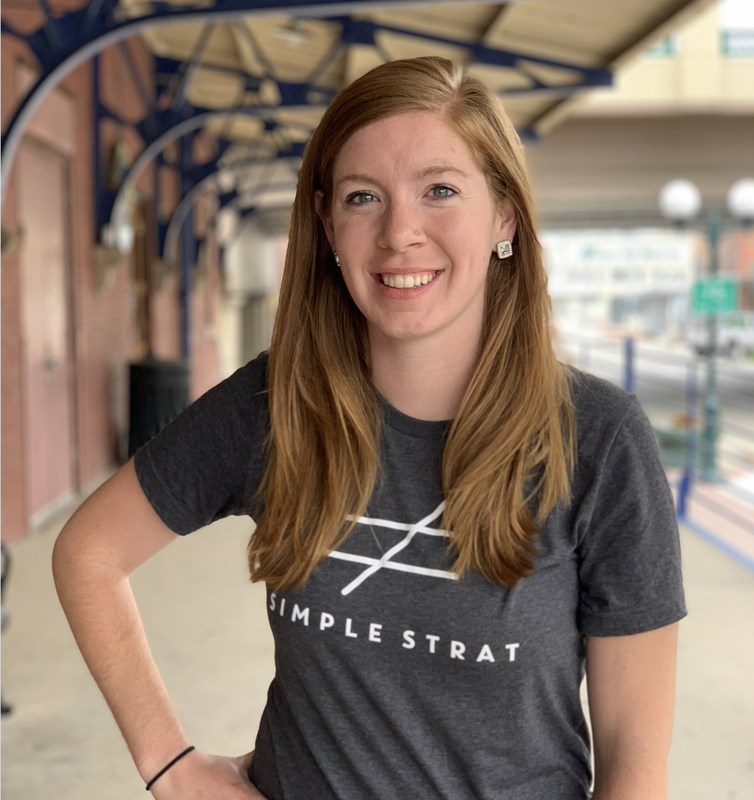 Here at Simple Strat, we love HubSpot and use it as the primary tool to power our own growth. But first and foremost, we care about strategy-backed growth and want you to get the most bang for your buck.